I hope everyone had a wonderful Christmas with their families! I sure did with my family!! It is always wonderful just spending a full day at home with the kids, watching them open their presents, play with their toys and eat a big home cooked feast!! But now that Christmas is over, it is time to think appetizers!! I mean think about it: New Year’s is next week and the Super Bowl is just right around the corner! Well Erik and I have a great appetizer for you! 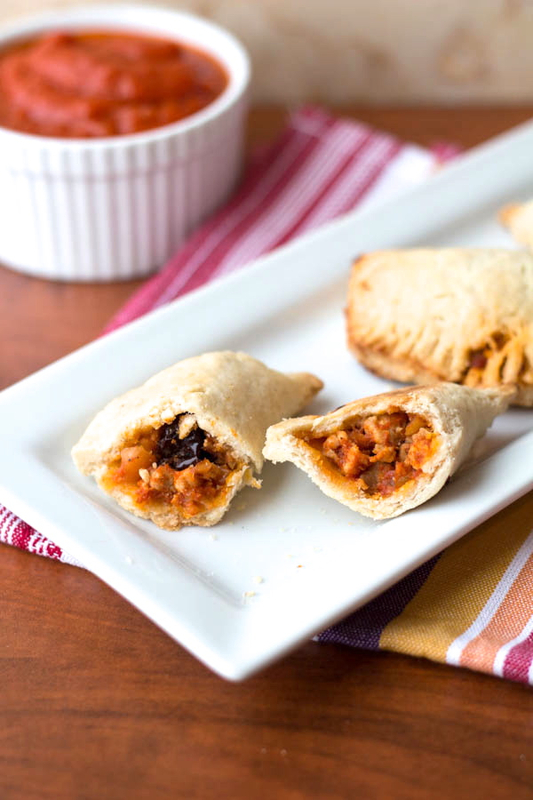 These Pork Piccadillo Empanadas are tasty, satisfying and sure to please! In fact, empanadas are just the kind of dish that Two in the Kitchen is built around! While Erik is busy making the pork filling, I am busy making the crust. I love meals where we come together as a team and contribute our own part to the dish! Empanada crusts are more like pie crusts than tortillas, though I still use my handy tortilla press to make them. (If you don’t have a tortilla press, these can be rolled out, though I HIGHLY recommend investing in a tortilla press as they are not too pricey) This empanada crust is light, flaky, buttery and perfect to encase the amazing pork filling!! Now for the picadillo filling. First; what is picadillo filling? The Spanish word picadillo refers to the meat being minced, or ground and in Latin American dishes, it is quite often a ground meat filling but, as is the case here, it can also be ground pork. Picadillo is a filling that can be used in a variety of Latin American dishes like tacos and burritos or empanadas. Erik, when he interned at Rick Bayless’s famous Frontera Grill in Chicago, often made a picadillo filling that used ground meat, raisins, and chopped almonds. For our version of picadillo, Erik took country style pork ribs, and ground them using our Kitchen Aid meat grinder attachment. He then cooked them up with raisins, chopped peanuts and a delicious tomato based sauce. 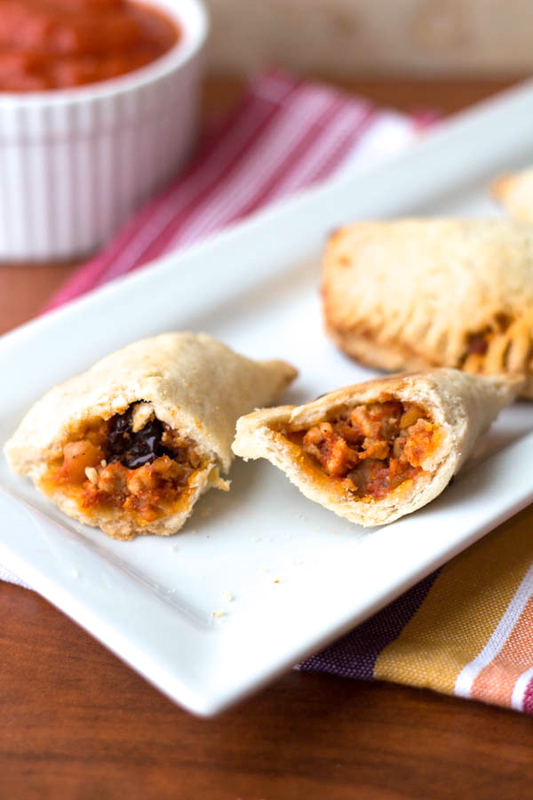 The result is an unbelievably flavorful filling that is perfectly well suited to pair with the fantastic corn empanada crusts!! 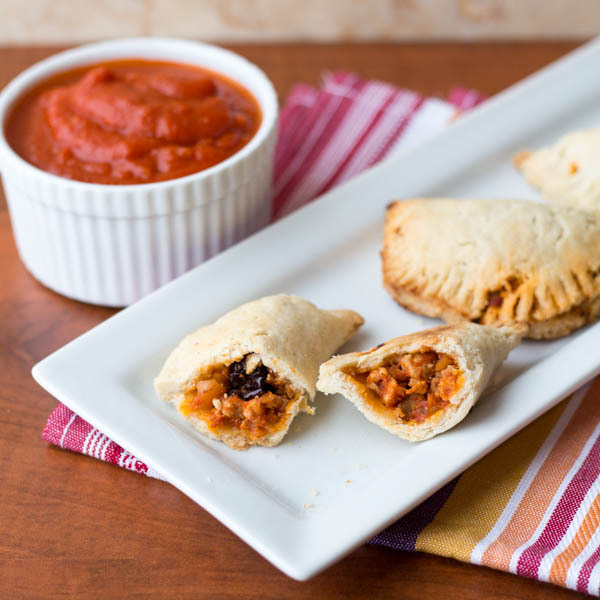 By saving a cup of the tomato sauce, you will have a great little tasty dip to sink your flaky empanadas into before you gobble them all up!! This dish is made even better by the fact that you can assemble them a few days before and refrigerate them before baking them in the oven when they are ready to be devoured. 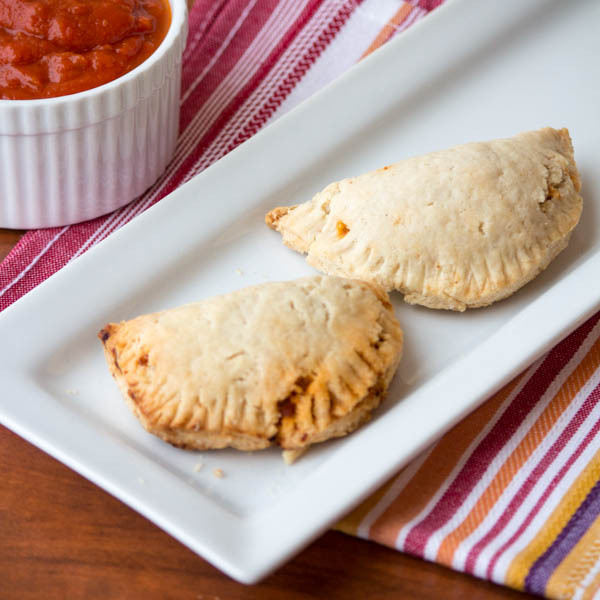 Empanadas are so delicious and versatile!! Make them as a snack, appetizer or meal!! For whatever purpose you make these, you are in for a real treat!! Add the oil to heavy bottomed pot and sauté the onions over low to medium heat stirring frequently until they are golden brown and beginning to caramelize on the bottom of the pan. While the onions are cooking puree the tomatoes (juice included) until smooth using a food processor or blender. When the onions are ready add the pureed tomatoes, cinnamon, and black pepper to the pot and stir to incorporate using a wooden spoon to scrape the bottom of the pan. Raise the heat to high, bring the pot to a boil, and then reduce it to medium heat stirring frequently until the mixture has thickened and reduced by about half the original volume. Remove 1 cup of the tomato sauce and set aside to use as a dipping sauce for later. In a separate skillet brown the ground pork over high heat and strain off any excess fat as necessary. Add the pork, peanuts, raisins, and cider vinegar to the pot with the tomato sauce and simmer for 5-10 minutes over low to medium heat. Make the crust by processing 1 c. flour, masa harina, sugar,and salt in a food processor until combined. Add butter and process until dough resembles wet sand. Add remaining flour and pulse several times until well combined. Empty mixture into a large bowl. Add vodka and water and using hands, combine dough until it forms a course ball that sticks together.Divide dough into approximately 20 golf ball sized balls, place in a covered bowl and refrigerate for an hour. Take each dough ball and dip in a bowl of water to make it easier to form into a crust. If using a tortilla press, line each side with plastic wrap and press the balls of dough to form a hand sized circle. Or roll out dough with a rolling pin on a well floured surface. Place a spoonful of filling onto the dough and fold over to form a half circle. Before closing, moisten the edges of dough with water using your finger tips to seal the edges. Use a fork to seal around the edges and use a small knife to cut off any jagged edges. (This is a messy process. Make sure to have plenty of paper towels handy!!! Once empanadas are assembled, you may wrap them in plastic wrap and refrigerate them up to two days or bake them immediately. Pre heat oven to 425 degrees and sprinkle olive oil on two rimmed baking sheets and place in the oven to slightly heat the oil. Remove sheets from the oven and place assembled empanadas on the sheets. Brush olive oil on the tops of each empanada, place sheets in the oven and bake for approximately 25-30 minutes. Remove from the oven and allow to cool slightly before serving them with the reserved tomato dipping sauce. Enjoy!! What a great looking snack food! I’ll be making a batch of these for Superbowl Sunday! I found you through the Show Stopper Saturday link party. Thanks Becca! They really are yummy!! Glad you stopped by! These look out of this world! I love that masa is used in the crust — I’ve had a bag lying around since I made my Mexican sweet corn cakes ions ago and I’ve needed another use for it. I’m going to have to try these! So glad to hear you had a wonderful Christmas Renee 🙂 Love the sound of this tasty and flavorful filling – these look incredible! Thanks for sharing and wishing you and your family a Happy New Year! These really are fantastic Kelly, in fact, I will probably make more tonight since we froze half of the filling mixture from the last time we made it!! Happy New Year! What a fun recipe! It sounds very different from my usual cooking, but it sounds like a fun change- I’ll have to see if I can find some masa harina locally. Thanks for sharing at Saturday Dishes! Thanks for coming by Jamie! Empanadas are yummy!!! I hope you can find some Masa harina. Have a wonderful New Year! Oh my – these look delicious! I love finger foods, and who doesn’t love pork ribs? Pinned! Thank you Kristi! These are yummy and a lot of fun to make! Especially if you have other people helping with the different tasks!